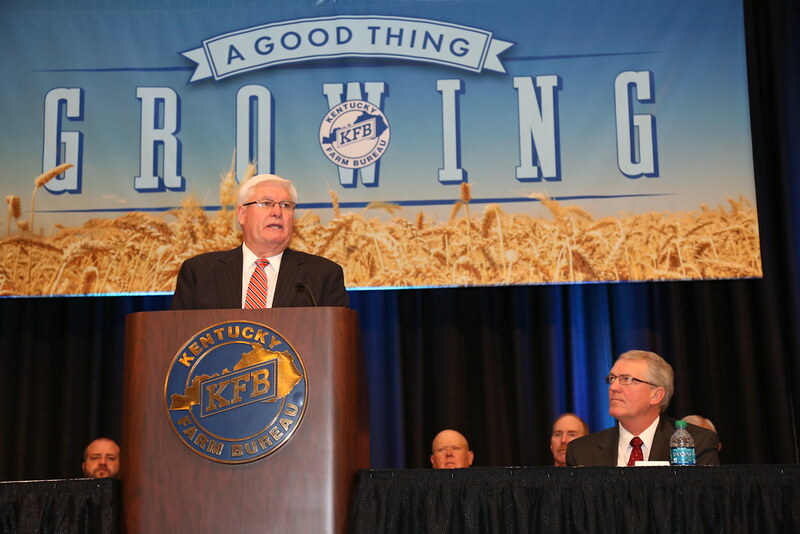 Louisville, KY (December 4, 2015) –Kentucky Farm Bureau (KFB) President Mark Haney addressed the organization’s 96th annual meeting today with positive news about continued growth for KFB, solid agricultural production news, a welcome to a new governor and agriculture commissioner and a thank you to members for all they do for the organization. Mark Haney, KFB’s president, gave his address during the organization’s 96th annual meeting, held at the Galt House Hotel in Louisville. KFB members from across the state heard Haney discuss the past year’s accomplishments including the work of the Water Management Working Group which has received praise at both the state and national levels. Haney said as water continues to be an issue, the work this task force has completed and will complete is vital to the success of agriculture in Kentucky. Haney noted the need to do a better job monitoring water stability in the state and some type of infrastructure will need to be put in place to do that. In other matters, Haney mentioned the importance of continuing the support of such issues as the 50 percent investment in agriculture of Master Settlement Agreement funds including keeping the Governor’s Office of Agricultural Policy in place, active and working forward. He noted that KFB will continue to be a watchdog on the rural road fund, and the support of the Kentucky State Fair Board having an agriculture representation of 50 percent. On the topic of taxes, Haney said taxes in Kentucky should be broad-based. “We also need to be in a place where we’re on par and able to be competitive with other states. We need to be positive for growth and business,” he said. Haney continued by saying some of the policies in the state are a disincentive to business here and it’s time to address some of these issues. From a national perspective, Haney said the Trans Pacific Partnership looks to be favorable to agriculture and will be favorable to Kentucky agriculture; he emphasized that if the Environmental Protection Agency’s regulation regarding Waters of the U.S. is implemented, it will be one of the most disruptive to agriculture for generations to come; and he pointed out the importance of having a good relationship with the American Farm Bureau Federation as a new president of the organization will be chosen at the annual meeting to be held in January. Haney also addressed the issue of GMO’s and how it is a part of the system to feed a growing population. He said that if states continue to pass individual regulations regarding labeling, it could stand to cause more confusion than answers. With that he concluded that KFB members should be active in their advocacy for these issues and base conversations on sound science. “My challenge to you is this; be knowledgeable, be engaged and be involved. That’s what we need in agriculture,” he said.